I stumbled across Eat Pretty by Jolene Hart a few weeks ago and instantly added it to my birthday wishlist. With my super hectic schedule I, unfortunately, usually have very little time to sit and dig into a good book. Perhaps that’s why I didn’t feel the urge to buy it there and then. However for the weeks that followed that oh-so pretty little cover kept popping into mind. Being the health enthusiast (some may prefer to describe as obsessive) that I am, I was eager to see what Eat Pretty had to offer. I won’t lie or pretend to be a beauty know-all. I keep my make up to a minimal and have sensitive skin, so use a lot of natural products. Health and fitness are my fortes. Anything to do with looking great through exercise or lifestyle and I’m on it. Which is why, I would soon discover, that Eat Pretty is be perfect book for me. Weeks later my birthday arrived and I wasn’t disappointed. My sister presented me with Eat Pretty, wrapped so neatly looking almost as delicious as the content. I was soon to get stuck in. Jolene Hart teaches that amplifying beauty doesn’t have to involve countless vanity products and tools- it can simply be achieved through what you eat. Hart condenses masses of beneficial food information into need-to-know snippets all in one cute little book, providing the perfect summary of what to eat to boost what health and beauty areas. Olive oil for sensitive skin, anybody? Butternut squash for healthy hair and ginger to warn off colds… The list goes on as well as recipes and food tips for all seasons. I won’t give too much away, but Eat Pretty is one health book that’s worth a read. I’m not saying to ditch the mascara, bronzer or eyeliner and especially not to drop the moisturiser. But you may find that you feel more beautiful, healthy and energetic within yourself if you pick up this little treat. 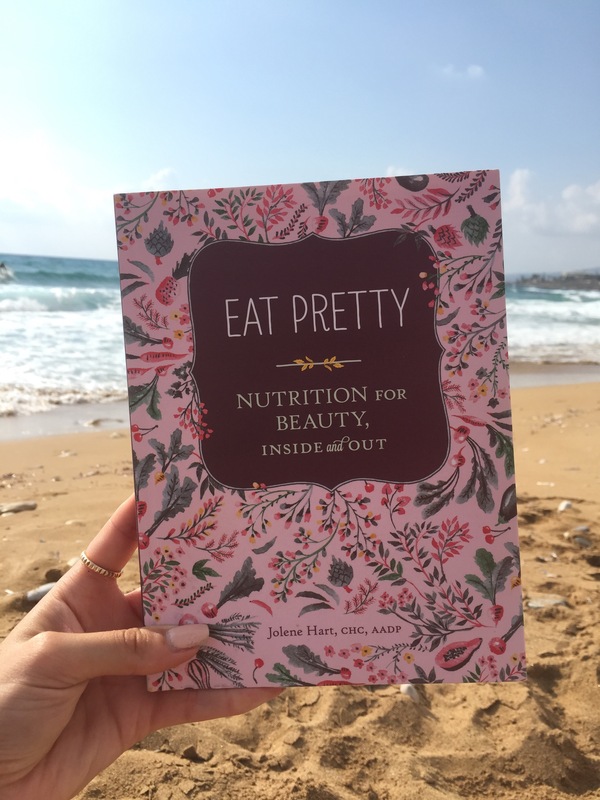 We really are what we eat and Eat Pretty provides the secrets to achieving ultimate natural beauty, inside and out.